Romaine lettuce is a healthy, popular variety of head lettuce, which is relatively easy to grow in a home garden or planter. 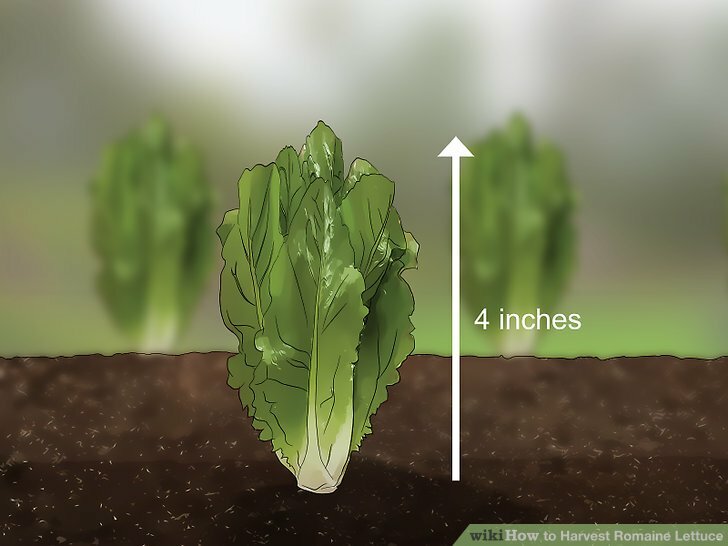 Romaine can be harvested in 1 of 2 ways: you can harvest the entire head of lettuce at once, whether by pulling up the head, roots and all, or by cutting off the head at the base. Alternately, you can harvest the outer leaves of the head and let the inner leaves continue to grow and mature. Harvest the romaine heads about 65–70 days after planting the seeds. 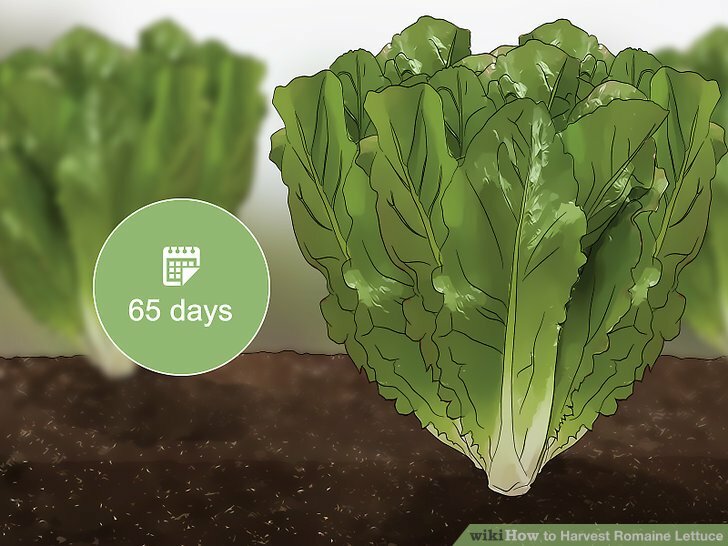 When grown from seeds, romaine lettuce takes only a little less than 3 months to fully mature. You can tell when the heads are mature by their visual appearance: they’ll have a dark green color and look leafy and open. Unlike iceberg lettuce, the romaine heads will not be densely closed in upon themselves when mature. Cut the entire head off above the base if you want a second harvest. 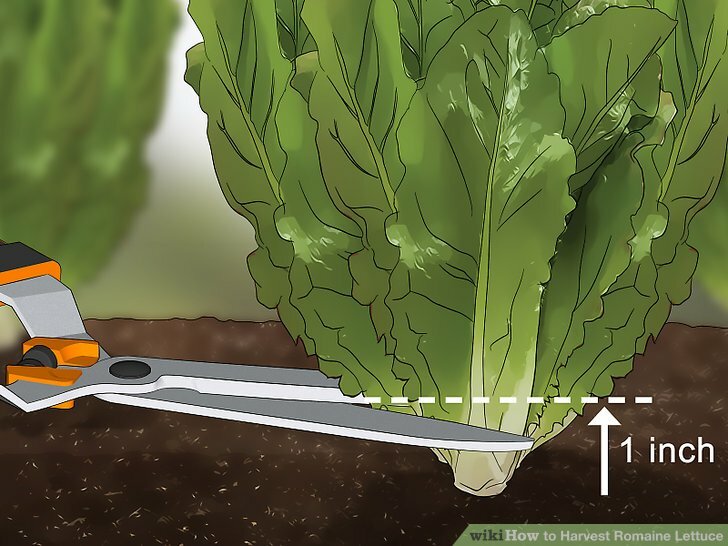 If you’d like to harvest the entire romaine head at once, use a sharp pair of gardening shears to snip through the base of the romaine. Make the cut about above the surface of the soil. Be careful not to cut through any rocks or soil, or you’ll end up dulling the blades of your shears. 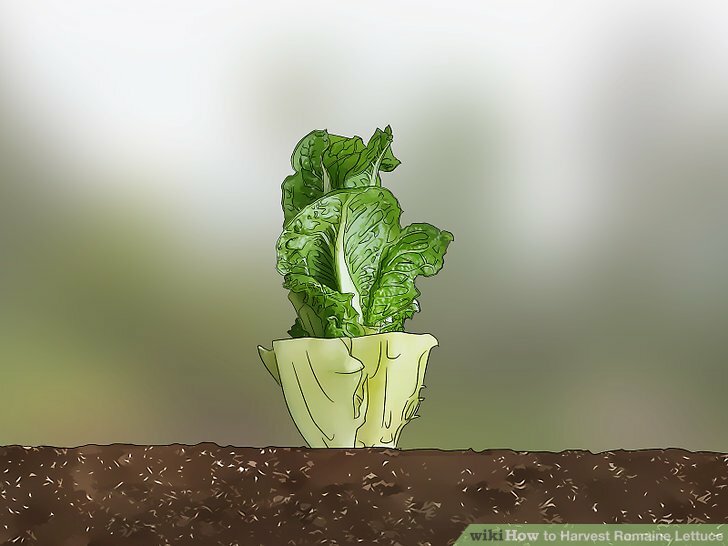 Give the lettuce time to re-sprout leaves after the first harvest. When you cut off the entire head at once, the roots of the romaine will often produce additional lettuce leaves. After they grow and mature, you’ll be able to glean a second harvest. You can expect to wait another 55–60 days for the second harvest. 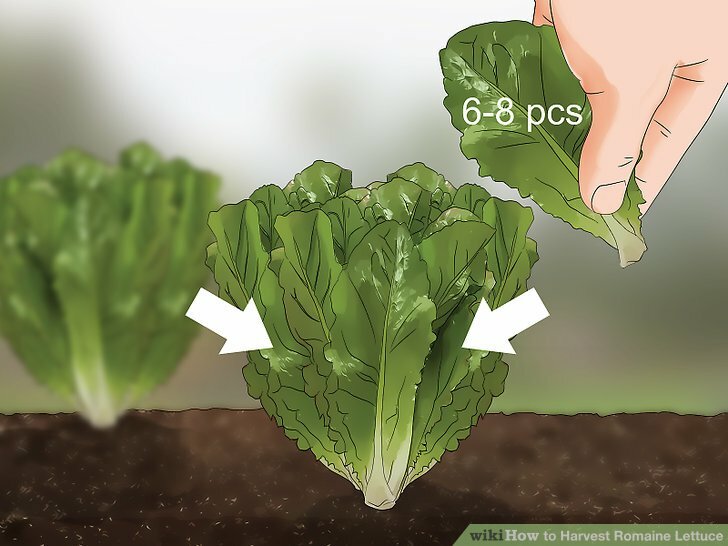 However, these leaves will not form another “head” shape, and will be looser and less numerous than the lettuce leaves on the initial romaine head. 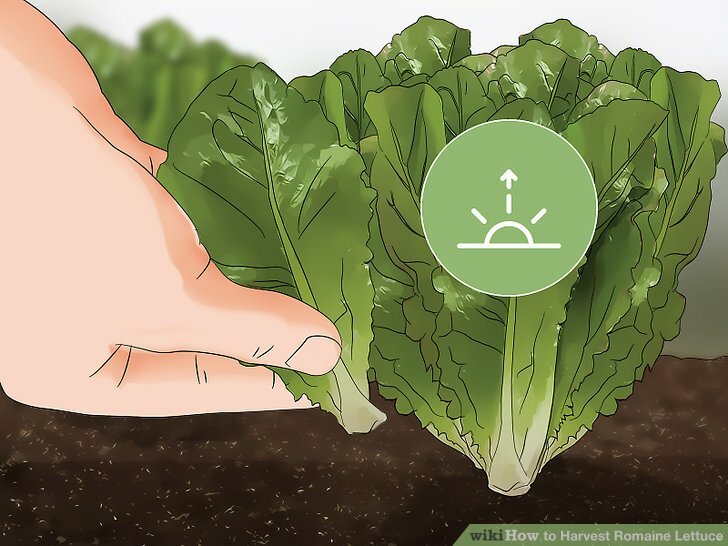 Pull the romaine head out of the ground to ensure a single harvest. If you’d rather not have a second harvest of lettuce, you can harvest the entire head of lettuce at once. You won’t need gardening shears for this. Just grasp the base of the lettuce head with one hand, and firmly pull upward until it dislodges from the ground. Pulling up the full romaine head will bring the roots out of the ground as well. Break any clumps of dirt off of the roots. 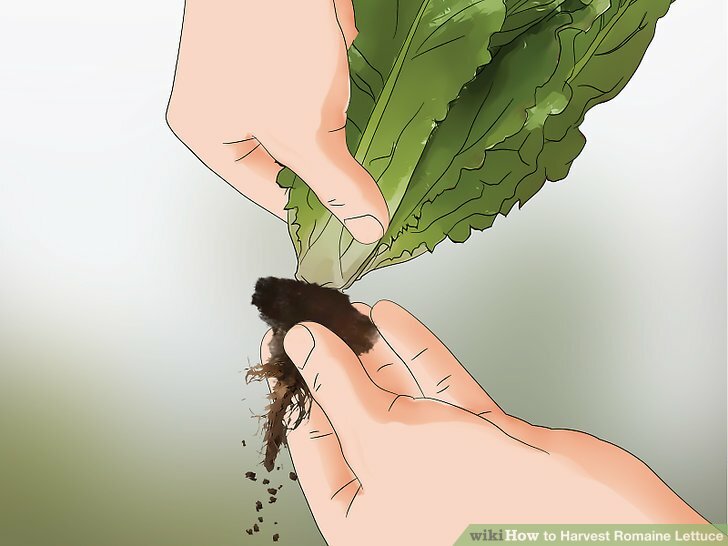 In order to leave the garden patch relatively undisturbed, and to avoid bringing dirt indoors, remove excess dirt from the romaine’s roots. You can do this with either hand while you’re pulling the lettuce head up from the ground. Once the lettuce is uprooted, pat the dirt back in place so there isn’t a hole left in the garden patch. 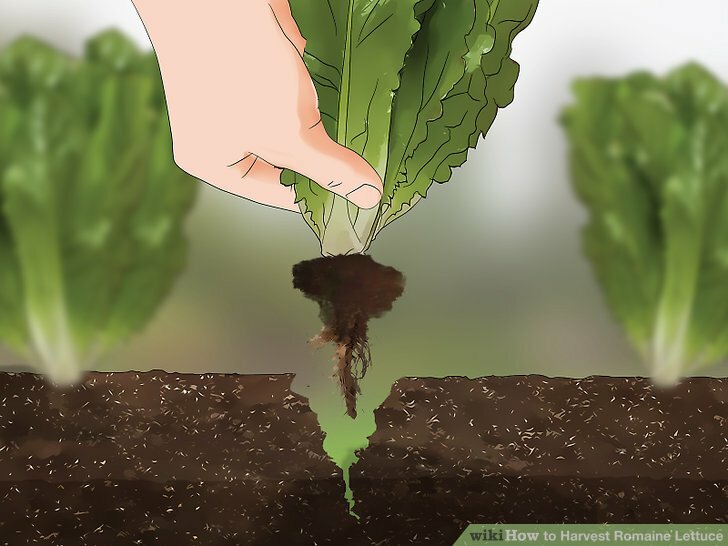 You can also dig around in the soil a bit to remove any leftover roots that may be stuck in the soil. If left in the soil, these leaves may re-sprout and grow more romaine. Break apart the lettuce head and rinse the individual leaves. 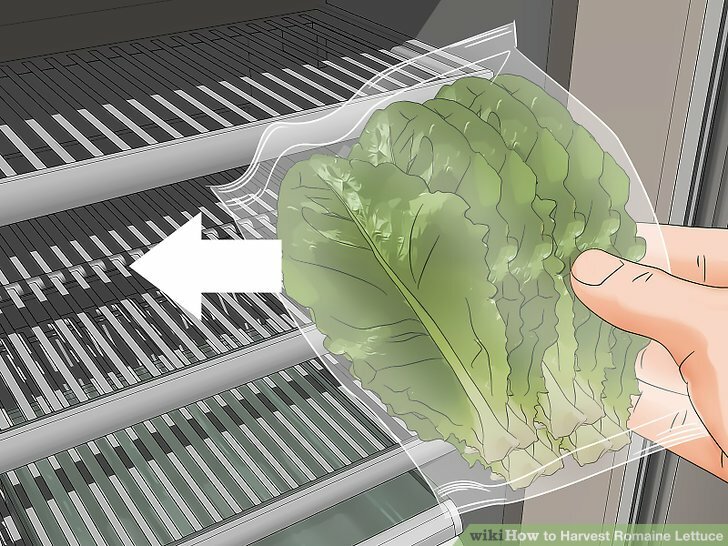 Once you’ve brought the lettuce head inside, break it apart by pulling each individual leaf away from the head’s base. Then rinse the individual leaves under cool tap water. You can serve the lettuce immediately in a garden salad, or keep the leaves for up to 10 days in an airtight bag in your fridge. Harvest the lettuce in the morning for fresh, crisp leaves. If you pick lettuce leaves early in the day, they won’t have been dried out by the sun. If you wait too long and pick your lettuce in the afternoon or evening, you may end up with slightly withered leaves. If you lose track of time and forget to harvest in the morning, it’s best just to wait until the next morning and harvest then. Mature romaine leaves are typically dark green and in height. Pick the 6–8 outer leaves first to prolong the harvest. If you’d like to have a harvest of only mature leaves, choose the outermost 6–8 leaves from the lettuce head. 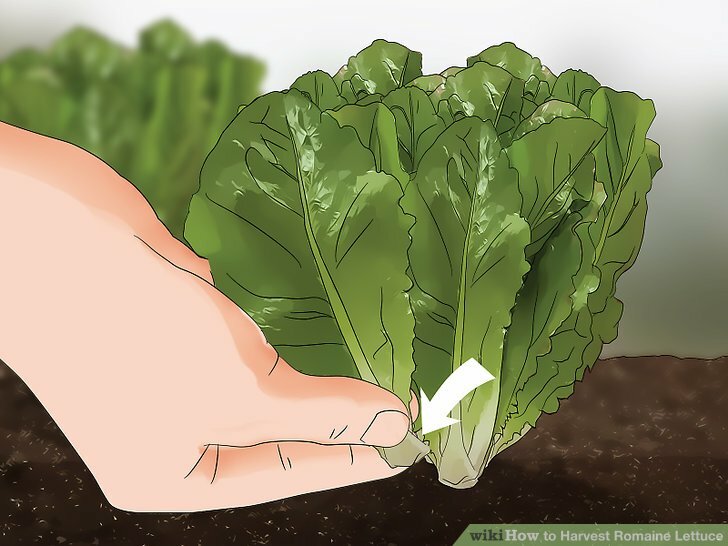 The advantage to this method of harvesting romaine is that you’ll be able to enjoy a prolonged harvest, as each set of inner leaves takes another week or so to mature. The disadvantage is that each harvest will be relatively small. Snap off romaine leaves with a sharp twist. 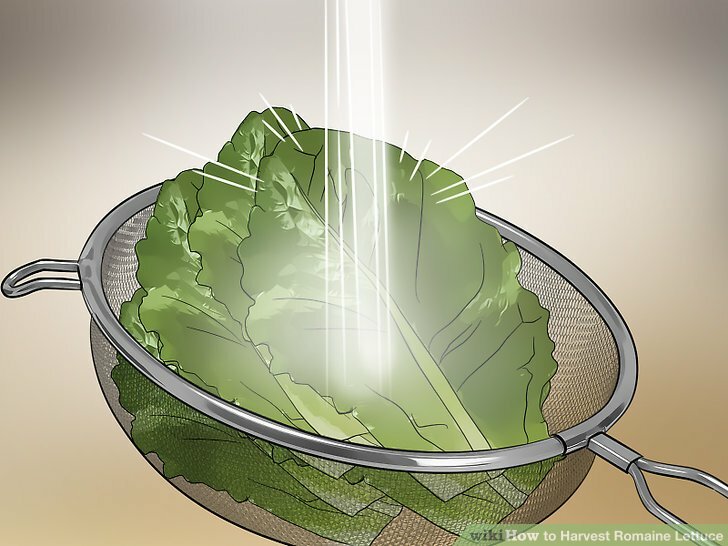 To pluck individual romaine leaves, grasp each leaf firmly at its base, and tweak it sharply downward until the leaf snaps off. If you try to pull upwards on the leaves, you may start to uproot the whole plant. Harvest the inner leaves once they’ve reached about . Keep an eye on the inner leaves of the romaine head and give them time to continue growing. Once they’ve opened up and matured, they’re ready to harvest. This process can happen quickly, so check on your garden daily. You’ll be able to get 3–4 additional harvests by picking only the mature, outermost leaves each time. Rinse the harvested leaves and store them in the fridge for up to 10 days. Once you’ve harvested the outer leaves from each of your romaine plants, rinse dirt off of the leaves by running them under cool tap water. Pat them dry and store them in a plastic bag in your refrigerator. If kept dry in the fridge, the romaine leaves should keep for about 10 days. Be sure to sanitize any cutting tools you use both before and after you harvest your lettuce. Always be sure to rinse your lettuce thoroughly with warm water before eating it, especially if you used any insecticide or fungicide while it was growing. If left to mature for too long, lettuce leaves will over-ripen and take on an unpleasant woody texture.